A storied castle. A band of rebels. And a nation chasing the centuries-old dream of freedom . . . What legacy will they leave behind? When Laine Forrester travels to France to attend her longtime friend's vineyard wedding, she expects to find a bride on the brink of a fairy-tale life. But after a series of unforeseen setbacks--a devastating diagnosis, a castle restoration put on hold, and the emergence of deep-seated family dynamics that threaten to derail the new couple's fledgling marriage--it seems the storybook life Laine had imagined for her friend--and once, for herself--is suddenly crumbling before her eyes. With hopes of resurrecting a happy ending for one of them, Laine throws support behind her friend and agrees to accompany the couple to the groom's family home in Ireland, where the merging of a mysterious inheritance, long-buried wounds, and a fractured family set out to upend the trip from the start. It's in the unlikely corners of a historic Dublin pub, and across the wide-open moors bordering Ireland's majestic Wicklow Mountains, that Laine is slowly drawn in by the land and the people, sparking hope for something she never imagined possible: the courage to heal. But with secrets of her own--and a heart afraid to trust again--Laine must determine how much she's willing to risk in mending the broken places within herself, and whether she believes that even through the depths of our pain, a beautiful story can emerge. Set in three time-periods--the revolutionary era of the late eighteenth century, Ireland's turbulent Easter week of the 1916 Rising, and present day--Castle on the Rise weaves a story of legacy, conviction, and redemption against the backdrop of Dublin's storied streets, and the stretch of Ireland's stunning emerald shores. It raises the question: given the choice between the fairy tale or a life of truly anchored faith--which legacy would you choose? A storied castle. A band of rebels. And a nation chasing the centuries-old dream of freedom . . . What legacy will they leave behind? Set in three time-periods--the revolutionary era of the late eighteenth century, Ireland's turbulent Easter week of the 1916 Rising, and present day--Castle on the Rise weaves a story of legacy, conviction, and redemption against the backdrop of Dublin's storied streets, and the stretch of Ireland's stunning emerald shores. It raises the question: given the choice between the fairy tale or a life of truly anchored faith--which legacy would you choose? Castle on the Rise is the second installment from the Lost Castle series by Kristy Cambron. I thought this time slip to be a fabulous read. It takes the reader to three eras set in Ireland, including present day, eighteenth century revolutionary, and the Irish Easter Rebellion in 1916. As a descendant of an Irish grandmother, I found the three stories to be intriguing and fascinating. I liked how the author brought the vision of it was in Ireland in those times. Her historical details were quite vivid. 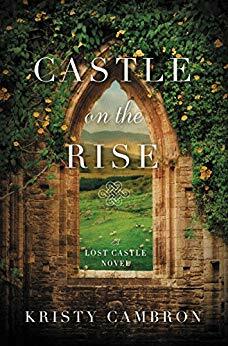 I loved Castle on the Rise and I highly recommend it. It is getting a well deserved five plus stars from me.